Hello all. 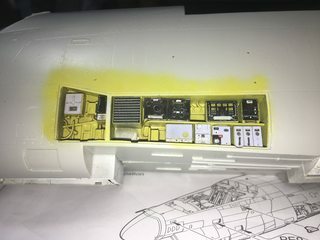 Was lucky enough to pick up Trumpeters 1/32 Corsair II with big ed photoetch set and a black box resin cockpit. So I thought I'd join in. Will do my best to get it finished before end December â€‹. First gb for mr and first time working with a resin pit. 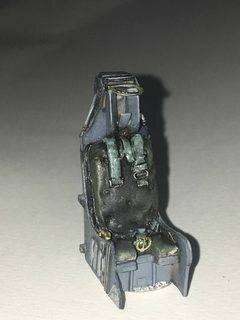 I must say the detail on the cockpit looks superb. In order to post images, you'll need to upload them to a third-party hosting site (such as Imgur, ImageShack and others - but anywhere will do), and then link to them in your post. We used to have a tutorial on how to do it using Photobucket, but we no longer recommend this particular service (to put it mildly). We really must get some others done, as this is a very common question, and difficult to answer concisely! Good luck, and sing out if you need any help. Our members use a wide variety of image hosting solutions, so whatever you choose, someone will definitely be able to assist you with it. Thanks Kev. Fiddling with imgur seems to have done the trick.Well heres where I'm starting from. Nice collection of goodies Tim. Hm, an old plane with modern goodies.... Everything looks normal... :PPP so far.. 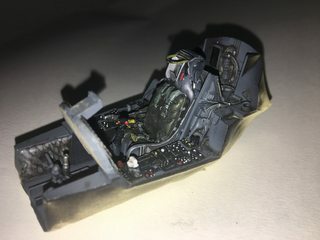 I see that you have the early cockpit set, what squadron will you be doing? I've got this kit awaiting some love on the shelf, so I'm looking forward to seeing this. Mark, from what I can see your build looks like it was anything but easy, it looks amazing, and I'd love to see more photos of it, would you consider posting some photos in the ready for inspection section? Thanks for the inspiration Mark. She looks a cracker! Ever wondered way or when a â€œkitâ€ become a â€œsheâ€? Anyway I'll be sticking to one of the kit options,probably the Va-192 CAG bird a pictured below. 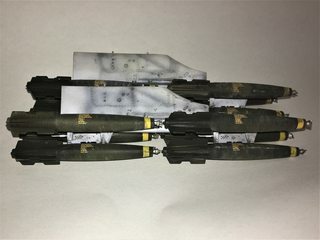 Firstly, down hear in deepest darkest Africa I haven't got time to wait for after market decals and perhaps more importantly this squadron is know for holding the record for the most ordnance dropped by the USN on a single cruise. (at least according to Wikipedia) Some 18000 lbs on the â€œLoation Highway Patrolâ€ so bit of historical significance for inspiration. 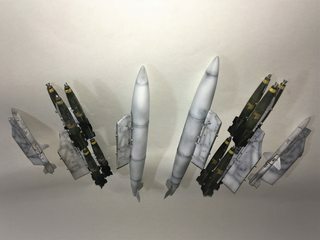 Anyway, I think I have a lot of mk82's to put together . By the way Mark, I completely agree with Squizzy. Looks an awesome build and would love to see more. 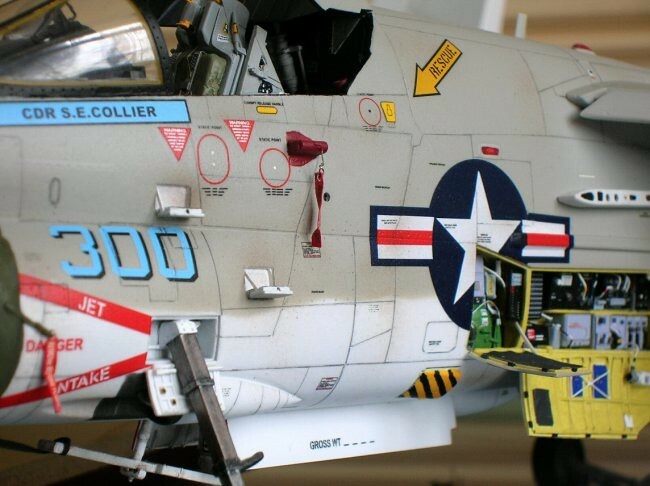 The USAF operated the A-7D Corsair II, not the same as the A-7E. Mine will as a USN bird. 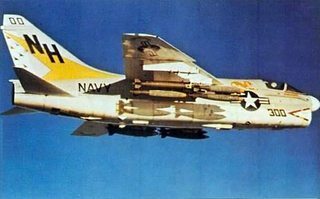 A7-E of VA192 (pictured above) operated from the USS Kitty Hawk in 1972 during Gulf of Tonkin operations. 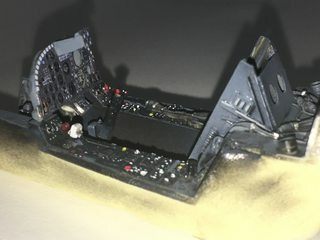 At least according to my reference- that particular one from Squadron publications "Aircraft Number 120, A-7 Corsair II in action"
Benchtime has been scarce the last 2 weeks. (Why does work get in the way of moelling time). Anyway, Ive been working on the extrenal stores and pylons which just need weathering . My logic behind this backward approach was because I tend to rush those assemblies in that hurry to finish project syndrome I'm prone to. 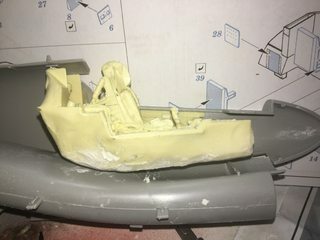 I did however get a couple of hours to clean up and start test fitting the resin cockpit. 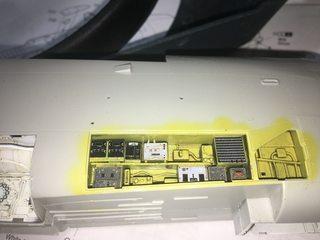 First time working with resin and I have 2 comments to make. 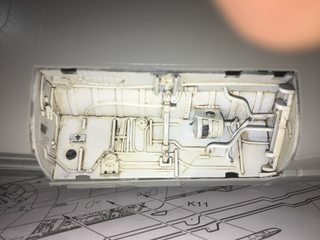 1st the detail is exquisite and 2nd the resin sanding dust get everywhare So far so good. 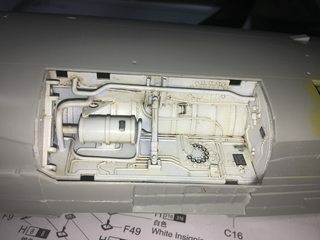 Once I'd sanded off a fair ampont of the base of the cockpit, where it was fouling the topf the intake ducting its basically a drop fit. Now some eyeball bleeding detail painting ahead of me to try and do the moulding justice. Bit of bench at last this week. 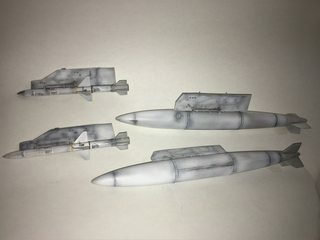 Painted up and weathered pylons and stores. Thought I'd start with the external stores first. My logic here is to avoid my inevitable tendency to rush this later towards the end of the build. Will be adding RBF tags later.